In the chart above, spending is broken into 12 categories: Reading, alcohol, tobacco, education, personal care, miscellaneous, recreation & entertainment, healthcare, clothing, food, transportation and housing. Each category is further broken down into spending by year, from 1941 to 2014, and each category is given a unique color. The data were collected from the Bureau of Labor Statistics. The data is adjusted for inflation and measures median spending of all Americans. Unsurprisingly, housing expenses have almost always been the largest area of spending in America for over 70 years. The only exception is 1941, when spending on food averaged $8,311, whereas spending on housing came to $7,537. However, in 1941 the government included alcohol in the food spending category, which inflates the food spending data for that year. In the other years, alcohol was given its own category. In every other year measured, spending on housing outpaced every other category. Another interesting trend is the downward slope of spending on clothing. Americans spent the most on clothing in 1961 for an average of $4,157. In every year measured since 1961, spending on clothing fell, even when accounting for inflation. At the same time, Americans began spending more on education, transportation and healthcare. Spending on education has increased far more than any other category, jumping from $242 in 1941 to $1,236 in 2014. Education spending increased at a particularly fast rate between 1984 and 1994 and onward. While spending on healthcare increased between 1941 and 2014, overall spending dipped between 1973 and 1984, but then began rising rapidly thereafter. 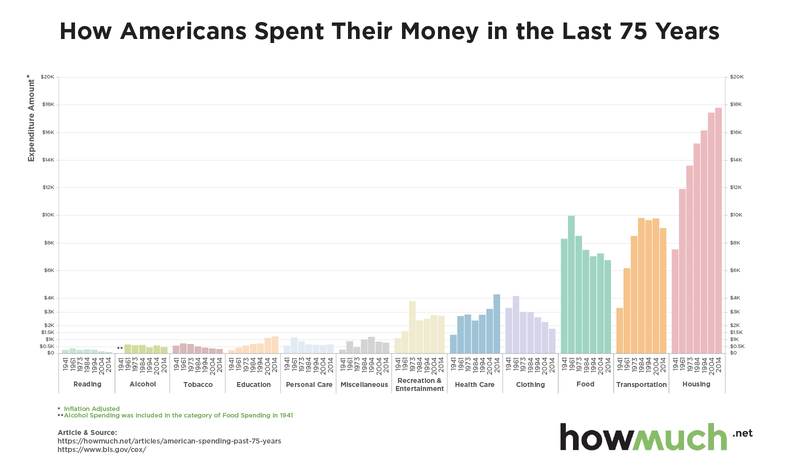 Between 1941 and 2014 Americans spent money on most of the same things, with a few changes. Housing has persisted as a large area of spending for Americans, as has the food category. However, spending on food and clothing has fallen when adjusting for inflation while spending on education and healthcare has risen quickly.